The notion of adjuncts was introduced in Section 2.4.2. We have already discussed details of some kinds of adjuncts — verbal adjuncts were introduced in Chapter 6. In this chapter, several additional types of adjuncts are introduced. The first type of adjunct we will analyze are those relating to personal reference. By “personal reference” is meant the grammatical description of nouns by abbreviated forms of reference. In most languages, this is accomplished by means of personal pronouns (e.g., English he, she, it, I, you, him, her, mine, ours, etc.). Generally, personal pronouns are distinguished by “person” (1st, 2nd , or 3rd) and case (e.g., compare English we, us, and ours). Ithkuil accomplishes the equivalent function by means of personal reference adjuncts, of which there are two types: single-referent and dual-referent. Like other adjuncts in Ithkuil, personal reference adjuncts are highly synthetic in their structure, comprised of at least two morphemes and usually more. Before we examine the componential structure of personal reference adjuncts themselves, we must first introduce the personal reference categories they refer to. The morpho-semantic delineations of Ithkuil personal reference categorization are based on inclusion or exclusion in relation to an utterance. These delineations begin with identifying whether or not the party speaking is included or excluded in relation to the utterance. The next delineation made is whether the party being addressed (i.e., the audience/listener) is included or excluded, then finally whether any third party (i.e., a party other than the speaker and the addressee) is included or excluded. There are 44 personal reference categories in Ithkuil, each of which is represented by a single consonant affix plus a corresponding falling or high tone as shown in Table 26 below. The various terms and abbreviations used in the table are explained following the table. The following sections explain the terminology in the above table. 8.1.1.2 Speaker and Addressee. These terms refer respectively to the party speaking (in Western grammar the first person), the party being spoken to (the second person), and a third party being considered or mentioned (the third person). Unlike the standard six-person matrix common in Western grammar (the three persons divided into singular and plural), Ithkuil divides personal reference along logical lines of inclusion versus exclusion in the speaker’s utterance. From the viewpoint of Ithkuil grammar, only a single individual can speak. Even if there are two or more persons speaking the same utterance simultaneously it is but a collection of single individuals, each of which is one speaker. Therefore, the “first person” of Ithkuil, the speaker, can be only MONADIC, never UNBOUNDED. Thus, in Ithkuil, there is no true equivalent to the word “we,” since inherent in the various categories which translate “we” is the concept of “I plus some other entity or entities.” From this we can begin to see how it is the idea of inclusion or exclusion in the speaker’s utterance that determines the various personal reference categories. The “second person” in Ithkuil is the addressee, the person(s) being addressed or spoken to. There can be one addressee, or more than one addressee, i.e., MONADIC or UNBOUNDED. The “third person” in Ithkuil is where things get very complicated, in that a party being referenced who is not the speaker or the addressee can have many distinctions, including the presence or absence of animacy, being MONADIC versus UNBOUNDED, being referred to as a collective entity, being an intangible abstraction, being indefinite, being an impersonal generic reference, or being a combination of two or more of these categories. These distinctions are explained below. 8.1.1.3 Animate vs. Inanimate. This is as it sounds. As we saw in earlier chapters, particularly Sec. 4.1, several important morphological categories in Ithkuil are dependent on whether the party to the act, condition, or event is a living entity or inanimate. Note that the distinction between gender (he vs. she) found in most Western languages does not exist in the Ithkuil personal reference system. 8.1.1.4 “Mixed” Third-Party Reference. It is possible for the third party being referenced to be two or more entities of different natures. For example a speaker could make reference to “I, you, and they” where “they” consists of a group consisting of one person (i.e., a monadic animate entity), three boxes (i.e., a polyadic inanimate entity), and an intangible concept such as ‘happiness’ (i.e., an abstract entity). In such cases, Ithkuil personal reference categories provide for such “mixed” parties to be included in a particular personal referent. 8.1.1.5 Collective Reference. This corresponds to the NOMIC perspective in which a noun can be spoken of as a generic collective. For example, the word ‘dog’ in the sentence The dog is a noble beast refers to all dogs in a collective sense, not any dog in particular. This COLLECTIVE category has its own set of personal reference affixes in Ithkuil, depending on what other entities are included in the context of the utterance. 8.1.1.6 Abstract Reference. This corresponds to the ABSTRACT perspective, equivalent to derivational abstract forms such as English nouns ending with -hood, -ness, etc. In Ithkuil, all nouns can be spoken of in this abstract sense (e.g., “bookhood” = the sense of being or functioning as a book), and the personal reference system provides affixes for this category whose form again depends on what other entities are included in the context of the utterance. 8.1.1.7 Obviative (4th Person) Reference. This category has no equivalent in Western languages, although it is found in various Native American languages. It refers to a third party referent other than one previously mentioned, which would otherwise be identically marked. 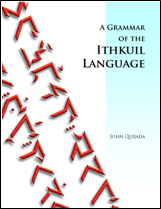 In Native American grammatical treatises, this category is usually termed the obviative or “fourth” person. For example, the English sentence He saw his book is ambiguous because we are uncertain whether ‘he’ and ‘his’ refer to the same person or to two different persons (i.e., one who did the seeing and another who owns the book). In Ithkuil, no such ambiguity occurs because the latter third person referent, if a distinct person from the initial third person referent, would be marked using the OBVIATIVE, not the third person. This disambiguation of third person referents is the purpose of the OBVIATIVE. Its translation into English is therefore dependent on a preceding personal referent. (See Sec. 8.1.4 below for more information about the OBVIATIVE). · One should never speak to clowns alone. · To dance the tango you need a partner. · They say it never rains in August. · That town is said to be haunted. · She just wants to talk to someone without being criticized. 8.1.1.11 Inclusivity vs. Exclusivity. Since Ithkuil personal reference adjuncts are designed to specify who among the speaker, addressee(s), and any third party is included or excluded in the context of the utterance, there are many possible personal reference distinctions possible in Ithkuil for which English has no equivalent pronouns. Such exacting distinctions would have to be made periphrastically in English, e.g., instead of saying ‘we,’ the speaker would have to specify ‘the two of us,’ or ‘I and he but not you,’ or ‘I, you, and they.’ Similarly, the English word ‘you’ breaks down into specific meanings equivalent to ‘you (singular),’ ‘you (plural),’ ‘you (singular) and it,’ ‘you and those people,’ ‘you and those things,’ etc. Adjuncts with one personal referent are termed single-referent adjuncts and have four forms: (1) a short form, (2) a long form, (3) a conjunct form, and (4) a collapsed form, as shown in Table 27 below. 8.1.2.1 Short Form: Form 1, the short form of the adjunct, consists of a single consonant (labeled C1 in the diagram) plus falling or high tone, corresponding to one of the 44 particular referents (as described in Sec. 8.1.1 above). This is followed by a single vocalic suffix Vc indicating the case of the personal referent (see Chapter 4 on Case). The 96 possible values for this suffix are shown in Table 28 below in the column labeled Vc. Note that for Case Nos. 49 through 96, Vc is the same as for the first 48 cases, plus a shift in the tone of the adjunct. Those personal referents which take falling tone shift to low tone, while personal referents that take high tone shift to rising tone. The short form of a single-referent personal reference adjunct is used when it is clear from the surrounding context of the utterance which previously identified noun participant is being referred to, so that it is unnecessary to indicate the Configuration, Affiliation, or Essence of the referent. The short form of the adjunct merely indicates the party itself and its case. 8.1.2.2 Long Form: Form 2 of the adjunct, the long form, contains an additional consonantal infix Cz followed by a vocalic suffix Vz. Cz indicates the referent’s affiliation, while Vz indicates its configuration and essence. (See Chapter 3 for an explanation of the Affiliation, Configuration, and Essence categories.) The default form of Cz is shown in Table 28 below in the Column labeled Vc+Cz.Note that for some noun cases (Nos. 18, 43-48, 56-59, and 61), the value of Vc changes when used with Cz in Form 2 of the adjunct, as shown in the table. The long form of the adjunct is used when necessary to indicate the Configuration, Affiliation, and Essence of the referent when the surrounding sentences do not provide or make clear this information. * For the 48 cases in the right-hand column above: in Form 1 of a single-referent adjunct, those personal referents with falling tone shift to low tone, those with high tone shift to rising tone. The table above shows Cz in its default (CSL) form. The full values for Cz are shown in Table 29 below. The referent’s Configuration are shown by the Vz suffix. The values of Vz are shown in Table 30 below. * For the last four configurations above, these can alternately be shown using the suffixes -a, -u/-i, -e, and -o (same as the first four configurations) plus a tone shift in the adjunct, as follows: falling tone shifts to falling-rising tone, and high tone shifts to rising-falling tone. This alternate means of indicating configuration is valid only for single-referent adjuncts. For dual-referent adjuncts (see Sec. 8.1.3 below), it is inapplicable and the vocalic values shown in the above table must be used. 8.1.2.3 The Conjunct Form: Form 3 of the adjunct, the conjunct form, is the same as the long form, Form 2, with the addition of one or more consonant + vowel prefixes Cs + Vs which correspond to the VxC derivational suffixes from Slot XI of a formative, as described in Chapter 7. When used in Form 3 of a single-referent personal referent adjunct, the order of the vocalic and consonantal portions of the affix are reversed. 8.1.2.4 The Collapsed Form: Form 4 of the adjunct, the collapsed form, is the same as the short form, Form 1, with the addition of a vocalic prefixes Vc2 which represents the case of a second instance of the same personal referent already indicated by the adjunct. In other words, the collapsed form is a short-cut means of representing two separate adjuncts, both of which refer to the same party, but in two different cases. Examples of such an adjunct were seen in Section 4.3.12 with the word êto, a short-cut for tê + to, i.e, 1m/GEN plus 1m/ERG. Our being here angers the clown. I got hit on the leg with a rock. Ithkuil allows a personal reference adjunct to show the personal reference category and associated case for two separate parties all in one adjunct. This is called a dual-referent adjunct and serves to combine two unrelated personal referents into one adjunct, no matter what their associated cases may be. There is only one form of a dual-referent adjunct, shown in Table 31 below. The four-way combination of Essence for Referent-1 and Referent-2 respectively is shown by the four available stress patterns: penultimate stress indicates NORMAL + NORMAL, ultimate stress indicates NORMAL + REPRESENTATIVE, antepenultimate indicates REPRESENTATIVE + NORMAL, and preantepenultimate indicates REPRESENTATIVE + REPRESENTATIVE. (See Section 3.5 on Essence). 8.1.3.1 Special Use of Short Adjunct Form. The short form (Form 1) of the single-referent adjunct discussed in Sec. 8.1.2 above (utilizing the abbreviated VC suffix from Table 28) can be used with the special dual-referent CK composite prefixes from Table 34 under the following circumstance: to show that two different parties are governed by the same case and participate equally with the verb, equivalent to connecting two pronouns in English by ‘and’ as in He and I went to the store or The man looked at them and me. Examples: ksau, /xlu. Note in the last example /xlu how the combination of a falling-toned referent and a high-toned referent combines to give a rising-toned adjunct. I bought it in the valley. Are those formally recognized groups of people making inquiries about the pair of you? In Section 7.4.13, the SWR switch reference suffix was introduced. This affix works with the OBVIATIVE personal referent (see Sec. 8.1.1.7) to specifically indicate which party is being referred to. The following is a review of this affix for all nine degrees. By use of this affix, reference can be made immediately to any party relevant to a discourse, even to a third party not previously mentioned. After my brother spoke to the clown, he [my brother] began running toward his [a third party’s] pet dog. As we saw in Section 6.3.1 and Section 5.10, Aspect can be shown as the Vs suffix to a verbal adjunct, in addition to the its more usual position as a consonantal affix Cs to a formative or verbal adjunct. However, in the absence of any verbal adjunct, and as another alternative to infixing Cs within a formative, Aspect can also be conveyed by simply using the Vs affix as its own autonomous adjunct. The woman returned to singing. Any Type-1 or Type-2 Vx-C formative suffix described in Chapter 7 may be removed from the formative and positioned as an adjacent adjunct for purposes of euphony (i.e., to reduce the number of syllables in the formative). Additionally, since affix categories represent common concepts generally applicable to many contexts, an affixual adjunct can also be informally used as a “short cut” method of conveying a notion, essentially as an abbreviated one-word sentence somewhat like an interjection or exclamation in English, thus conveying the concept of the affix category. For example, the affix -V1j/7 connotes disappointing typicality, but as an affixual adjunct, oj, it can be used by itself as an informal expression translatable by the English phrase How typical! Çtar-ryo igraleiţrar eglulôn. → Ar çtar-ryo eirţ igral eglulôn. If only the physician wouldn’t always eat his food in one gulp like that.